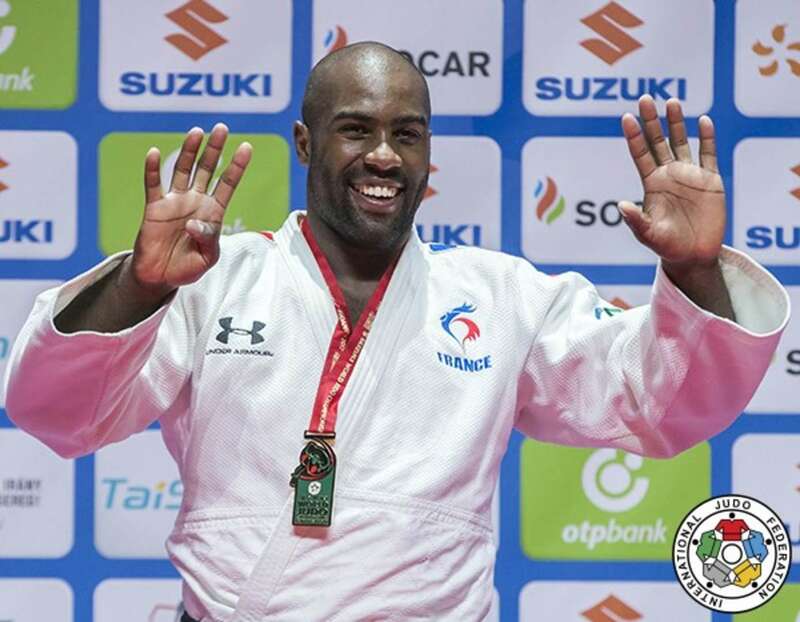 Double Olympic champion Teddy RINER (FRA) ruled the world for the ninth time as judo’s all-time great won all of his six contests in Budapest and overcame one of his toughest challengers on the last day of the individual competition in Hungary. RINER, 28, who is arguably the most dominant athlete on the planet, extended his winning run to 134 consecutive contests, a statistic which dates all the way back to 2010. The heavyweights starred on Saturday as China and Japan won gold alongside France to alter the medal table outlook as RINER lifted his country up to second place. 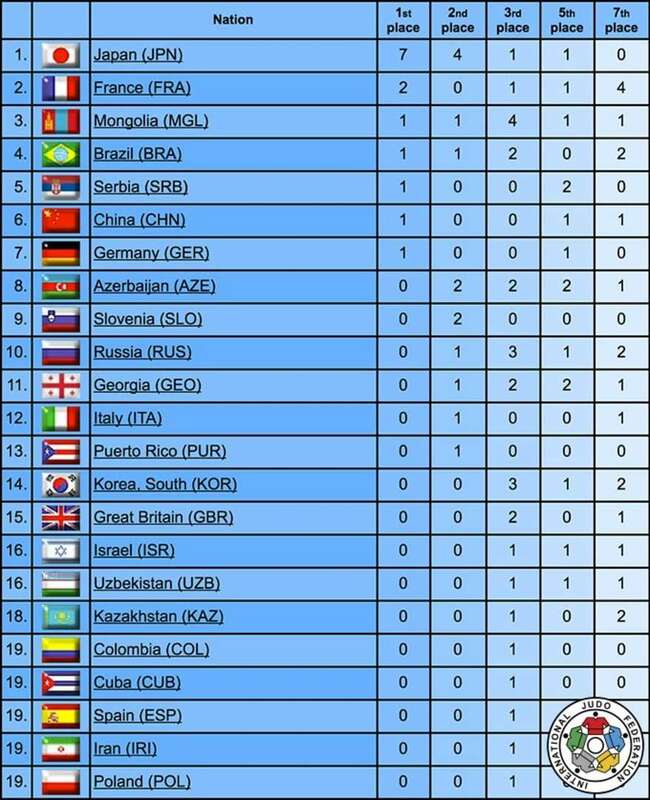 Japan finished top of the medal table with seven gold, four silver and one bronze medal ahead of France who claimed two gold and a bronze. Mongolia recorded their biggest medal haul at a World Championships with a total haul of six which was comprised of one gold, one silver and four bronze. The draw for the first Mixed Team Championships took place on Saturday afternoon ahead of the final block as 21 nations discovered what lies between them and a place on the podium on Sunday. Double Olympic champion and newly-elected Chinese Judo Association President XIAN Dongmei and Barcelona 1992 Olympic champion and 1993 world champion KOVÁCS Antal preceded over the draw which started with Japan as the top seeds based on the individual World Ranking List. 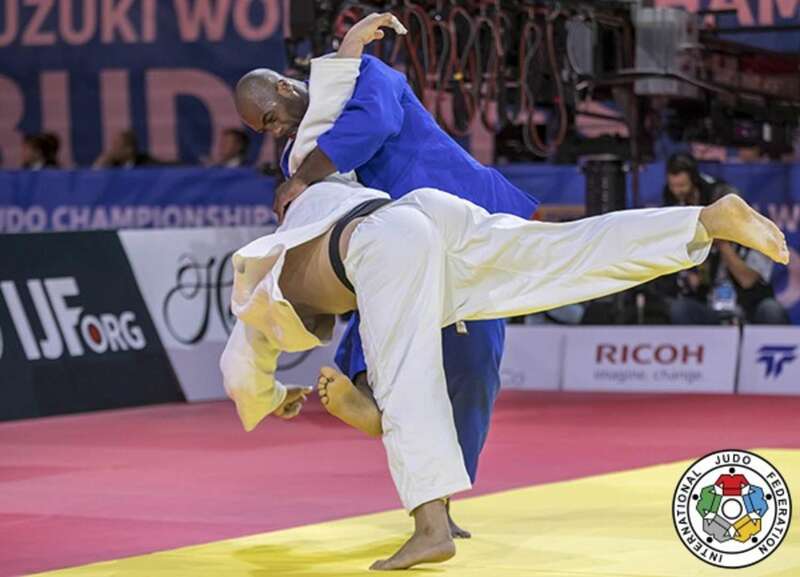 The IOC recently added the Mixed Team Competition to the Tokyo 2020 Olympics programme and Sunday's anticipated competition will be the first time the IJF has held this version of the team event at the senior level. 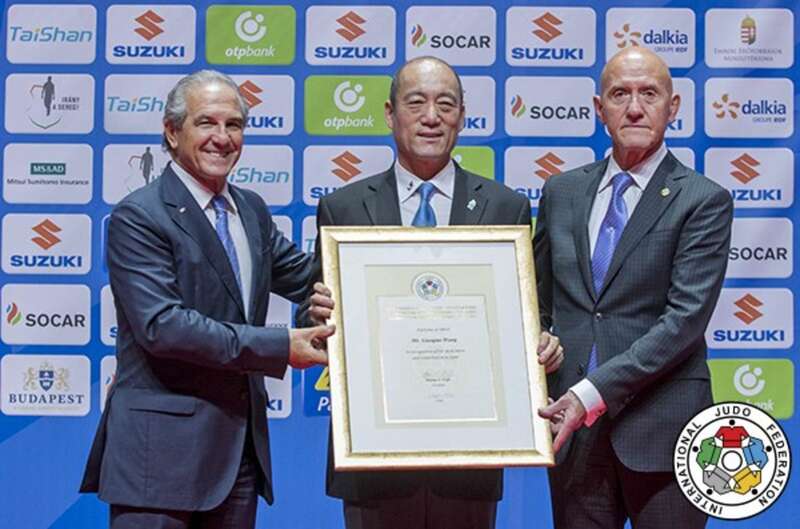 Mr. WANG Guoqiao of China, IJF A international referee, received today the IJF Diploma of Merit from IJF Head Referee Director Mr. Juan CARLOS BARCOS and Mr. Jan SNIJDERS, in recognition of his contribution to judo. 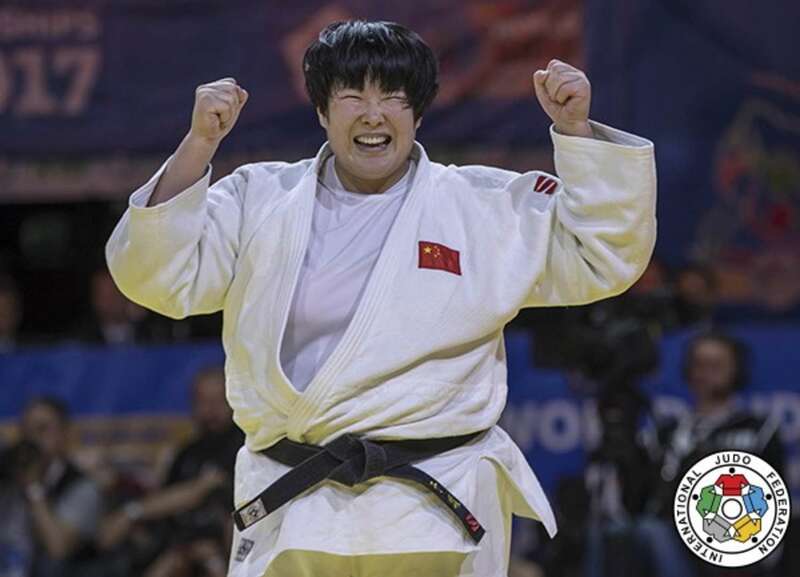 Rio 2016 Olympic bronze medallist YU Song (CHN) retained her heavyweight world title with a battling displaying on Saturday in Hungary. YU, 31, who was only competing for the second time since Rio 2016, defeated 2014 Junior World Championships winner and world number three ASAHINA Sarah (JPN) in the final for gold. ASAHINA, 20, was supported from the stands by her parents, started judo at the Kodokan Judo Institute and still lives around the corner from the home of judo. The Tokai University student, whose dad ASAHINA Terry is a Kodokan 4th Dan, took the contest to the Chinese veteran in their first meeting. Golden score was needed to separate Asia and the world’s premier heavyweights and it was YU who triumphed to win her second world title when ASAHINA was penalised for being passive after two minutes of golden score. 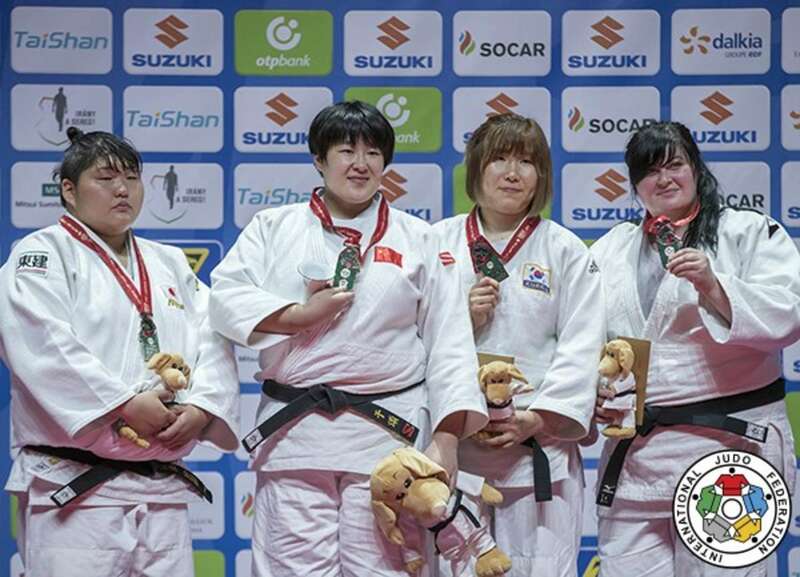 In the first semi-final two-time Grand Slam bronze medallist Iryna KINDZERSKA (AZE) lost out to YU by a waza-ari score as Europe failed to break the Asian monopoly of the heavyweight women’s category. In the second semi-final Worlds debutant ASAHINA outfought former European champion Kayra SAYIT (TUR). A waza-ari score for the Japanese was the difference after four minutes as the ashi-waza of the former wore down the Turkish judoka. In the first bronze medal contest world number eight KIM Minjeong (KOR) defeated SAYIT in golden score to win her first World Championships medal. A waza-ari score after 90 seconds of additional time provided South Korea with their third bronze medal of the competition when SAYIT overstretched as she attempted a uchi-mata and was off balance and KIM took full advantage. In the second bronze medal contest KINDZERSKA bested world number 11 Tessie SAVELKOULS (NED) by three waza-ari. The pick of the three came from an o-guruma and there could be more to follow from Azerbaijan’s women during the team competition on Sunday. 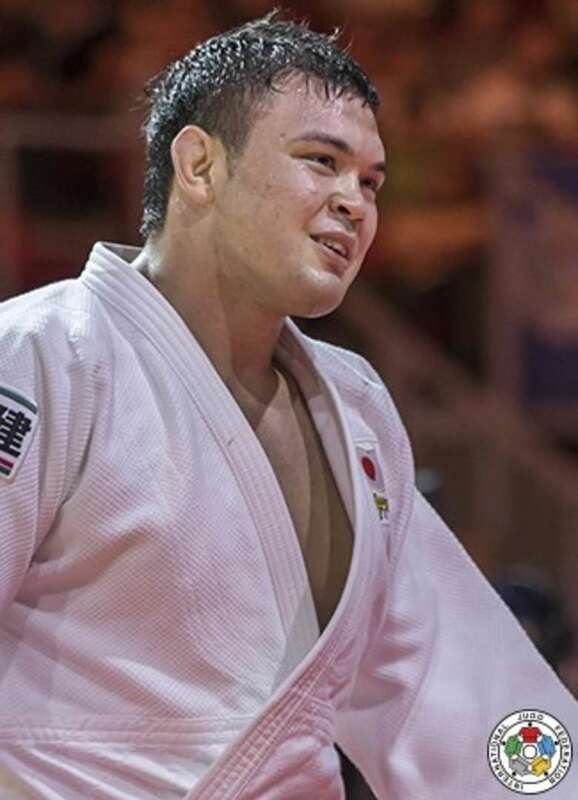 Tokai University’s WOLF Aaron (JPN) defeated Rio 2016 Olympic silver medallist Varlam LIPARTELIANI (GEO) to become Japan’s seventh gold medallist in Budapest from a total of 14 weight categories. WOLF, 21, stole the show in his first World Championships as LIPARTELIANI, 28, was beaten only at the final hurdle on his inaugural outing in his new category having moved up from -90kg in February. As ‘LIPO, LIPO’ chants rang out from all corners of the teeming arena, WOLF, who had watched teammate and defending world champion HAGA Ryunosuke fall in the second round, caught the three-time -90kg world medallist from Georgia with an o-uchi-gari in golden score for gold. 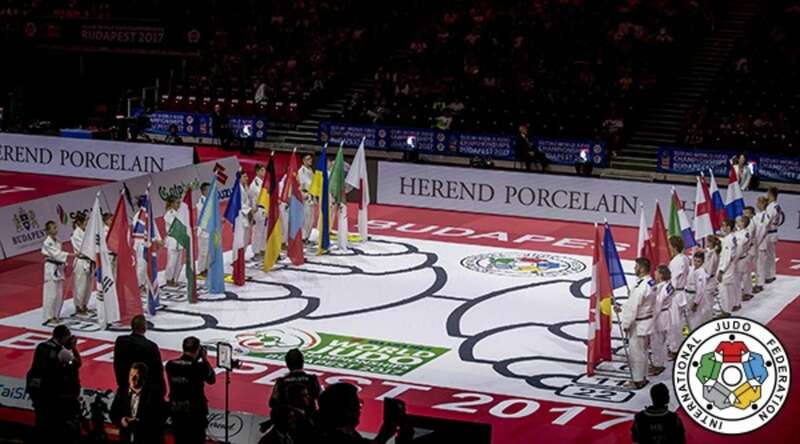 In the first semi-final world number one Michael KORREL (NED) fell to WOLF in golden score by a waza-ari after 27 seconds while in the second semi-final LIPARTELIANI defeated European champion Elkhan MAMMADOV (AZE) who received three shidos to be disqualified. 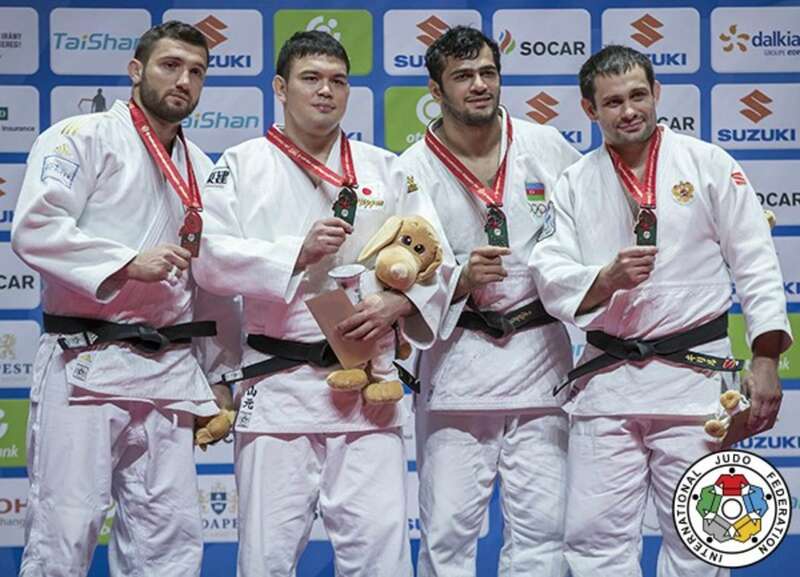 In the first bronze medal contest Rio 2016 Olympic silver medallist Elmar GASIMOV (AZE) defeated MAMMADOV after 90 seconds of golden score by a waza-ari. 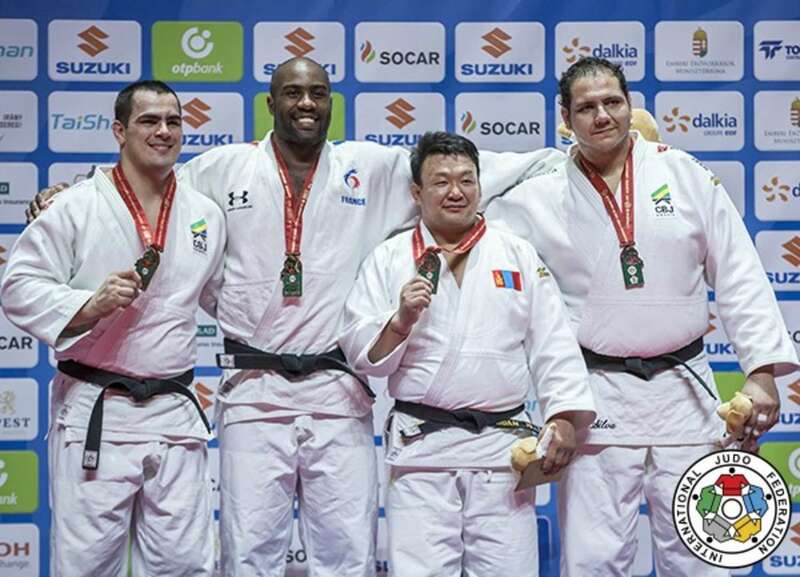 In the second bronze medal contest KORREL was humbled by Hohhot Grand Prix silver medallist Kirill DENISOV (RUS). DENISOV countered weak ashi-waza from the Dutchman and pinned him down for the final place on the -100kg podium. It was a tame effort from Dutchman as DENISOV won Russia’s fifth Worlds medal and first at this weight. 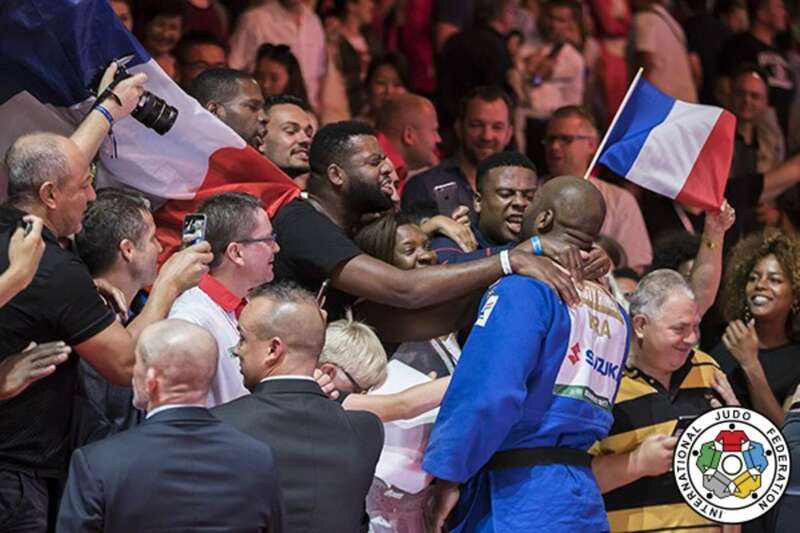 French heavyweight king Teddy RINER (FRA) fought for the first time since the Rio 2016 Olympics and looked like he had never been away. While the Frenchman remained the favourite for the title, there was high expectations from all as new challengers had emerged while he had been away and the rules had been modified during his absence. 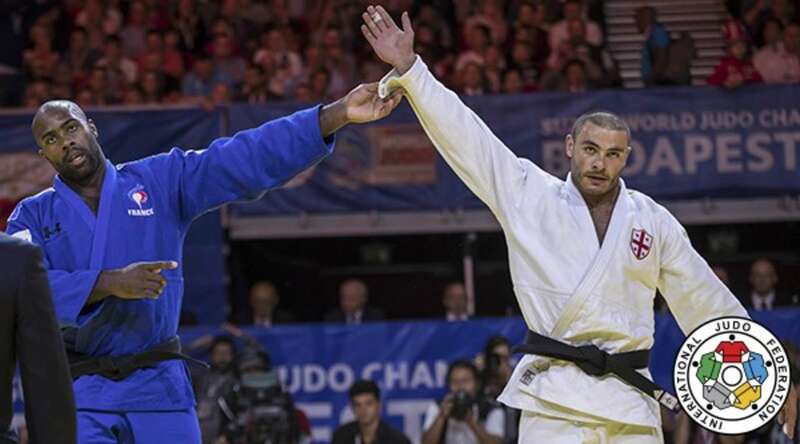 The 28-year-old heavyweight king extended his run of consecutive contest wins to 134-0 as he won five of his six contests by ippon including the final against world number one David MOURA (BRA). RINER threw with a sasae-tsurikomi-ashi after two minutes of golden score to bring the crowd out of their seats and sent the French fans wild. The Frenchman fell to his knees in jubilation and raised both of his hands up in the air as the French flags were flying highest in Budapest. RINER said that everyone wants to beat him, to put his name on their CV, but nobody has wanted it more and tried harder than the young Georgian and European champion Guram TUSHISHVILI (GEO) who showed no fear but lots of heart. The Georgian came close to scoring in golden score as he claimed a waza-ari but RINER landed on his front and with one elbow down. While the Frenchman was rattled he showed his championship qualities by dispatching the plucky youngster who could not contain his disappointment but still left the field of play with his head held high. 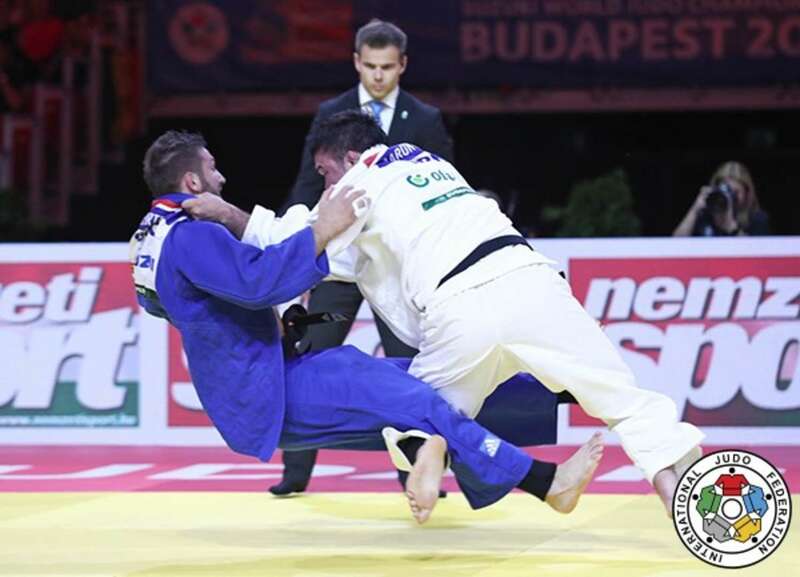 MOURA beat former Baku Grand Slam winner BOR Barna (HUN) in the second semi-final to reach his first Worlds final. In the first bronze medal contest Beijing 2008 Olympic champion NAIDAN Tuvshinbayar (MGL) defeated TUSHISHVILI in an astounding achievement for him and his country. 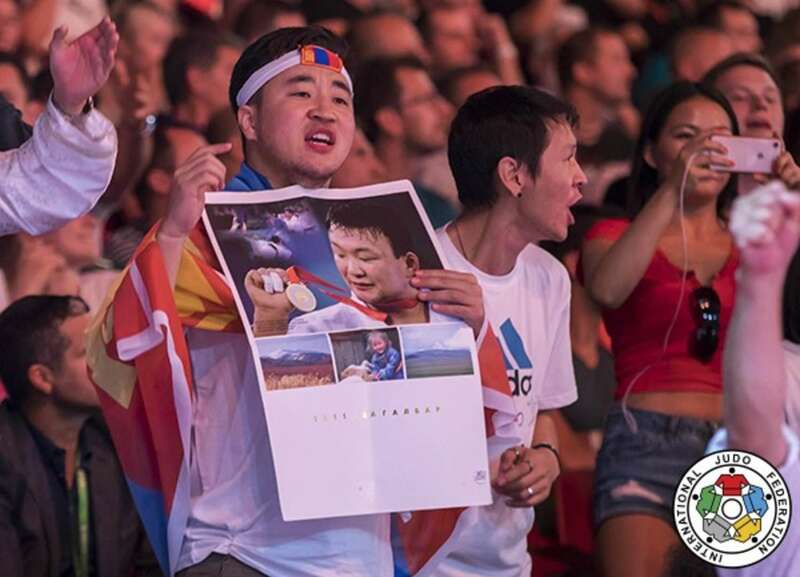 The Mongolian fans in crowd, who were holding up calendars with his face on and 2008, roared with pleasure for their 33-year-old compatriot who took silver at London 2012 and was competing in the heavyweight category for the first time since a rare +100kg appearance in 2011. When NAIDAN returned to the warm up area after his contest to prepare for the awarding ceremony, the first man to congratulate him was -100kg Olympic champion and former world champion Lukas KRPALEK. The Czech Republic heavyweight, who was with his son and wife, watched the action in Budapest having had to pull out through injury a week ago. In the second bronze medal contest double Olympic bronze medallist Rafael SILVA (BRA) dismissed BOR in golden score when the home judoka was penalised for the second time. A second shido for the Hungarian separated the two after they had been tied with a shido apiece in additional time as the hosts missed the medal podium in the individual competition.